How long have you been dreaming about Lakefront Living? This unique, spectacular Home in the heart of Lake Mary will make all your dreams come true! Stately Executive Home with unparalleled designer appointments, plus jaw-dropping views of Big Lake Mary! Brick-paved entrance and driveway welcome you to this picture-perfect home, impeccably maintained, and as a bonus, a newer roof (2015)! TOTAL remodel in 2001! With nearly 5000 sq. ft. of waterfront opulence, there is nothing else like this currently offered, and especially not at this price! The downstairs Owner's Retreat has a separate Sitting Area/Den & has a spa-like ambiance that is heightened by the views of the Lake from your soaking tub from the glamorous Bathroom. Rich Brazilian cherry flooring, plus chiseled-edge Travertine throughout the main living space. Gourmet Island Kitchen w/ granite & DREAM PANTRY has too many bells 'n whistles to list, and is open to the casually elegant Family Room w/ Fireplace & more water views! Wait until you see the Wine Bar w/wall of bottle storage! Pour a glass, head out to the Billiard Room, w/French Door-access to the pool deck for a cigar! Impressive pool/spa area looks like a resort...who needs The Ritz?? You'll feel like you are on vacation every day! 4 additional bedrooms (2 down/2 up). Enviable Dock & Boat House, from which the owners have caught some real Lunkers (ask us for pics)!! Seminole County Schools! 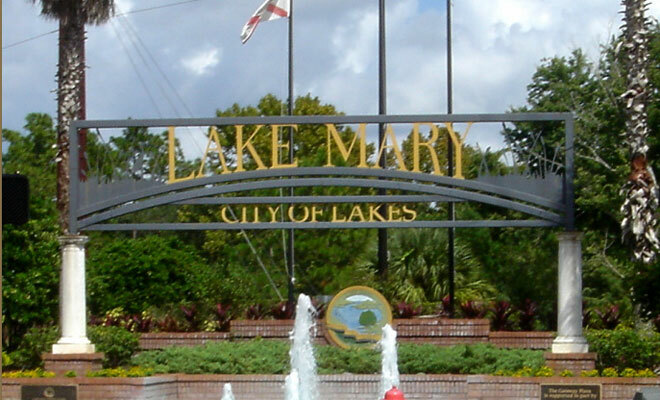 Just steps from the shops & restaurants on Lake Mary Blvd. You need to hurry on this one! Come live the LAKE FRONT lifestyle in the beautiful and secluded Ravensbrook community. Located off Markham Woods Rd, this expansive pool home was designed for entertaining. Watch the sunsets over skiable Rice Lake from the deck of your oversized swimming pool and 1.5 ACRES of land. Pulling up to the home, the perfectly landscaped lawn sets the tone for the pride of ownership in this 1-owner home. The huge, circular driveway and 3-car garage offer ample parking without taking away from the lush landscaping. Walk in the home to direct views over the pool to the lake. Hosting 5 bedrooms, 4.5 baths + office, this 4,700+ sq. ft. home has too many features to list such as a half basketball court, whole house generator, gas hookups, and newer roof (2015). The air-conditioned sunroom with custom, Pickled Wood ceiling offers breathtaking views of the lake. Just through the double set of French doors is the massive great room home to a wet bar, ice maker, and dinette area. The kitchen overlooks the great room for an open-concept feel. A true 3-way split plan, it features the office and three bedrooms downstairs, a master suite with private balcony upstairs, and a separate bonus room or 5th bedroom on the far end of the home. The indoor laundry room is home to built in hampers, sink, closet space, and sewing area. Outside the 18 8217;x 38 8217; pool includes a spa and separate pool bath. Conveniently located within minutes to I-4 and Lake Mary Town Center, Ravensbrook is also home to top-rated Seminole county schools. PRICED TO SELL! This custom home by Charles Steffe Construction situated on a 1.1 acre private lot is move-in ready and impeccably maintained by the original owners. This two story home features one story living with a bonus/media room, fourth bedroom and fourth full bath upstairs. Downstairs enjoy an expansive master suite split from the secondary bedrooms. This immaculate 4 bedroom, 4 bath home boasts a downstairs home office, elegant living and dining areas and well appointed kitchen with custom cabinets, stainless appliances, wine/bar area with wine refrigerator and spacious family room with built in cabinets and a gorgeous view of the pool, lanai and oversized rear yard. 3 car oversized garage with side entry and additional parking. Oversized laundry room. Whole house GAS GENERATOR valued over $20K! The salt pool and lanai area are just exquisite with $40K custom screen enclosure with columns, lighting, brick pavers and pebble tec finish to the huge pool. Truly an entertainer's dream home. Come live the good life in the hidden gem of Carisbrooke within minutes to I-4, SR 46 and Lake Mary shopping and entertainment!